New Delhi, July 26 (IANS) Nitish Kumar’s resignation as Bihar Chief Minister on Wednesday has come as a big setback for the opposition which was seeking to join hands against the Narendra Modi government on a range of issues ahead of the 2019 Lok Sabha elections. 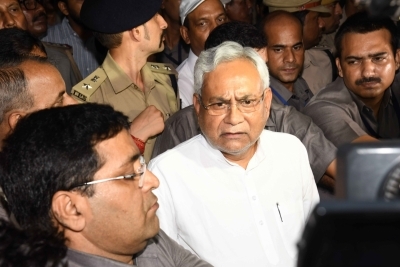 Nitish Kumar had worked to stitch up a Grand Alliance with the Rashtriya Janata Dal and Congress in Bihar in 2015 that delivered a crushing blow to the BJP in the Assembly polls. Following the outcome in Bihar, a similar alliance where opposition parties join hands in a multi-cornered contest, was seen as a model that could be replicated in other states to defeat the BJP. In Uttar Pradesh, where the BJP scored a resounding victory in the Assembly polls earlier this year, there was talk in political circles that the Samajwadi Party, Bahujan Samaj Party and Congress should have joined hands to form a Bihar-like alliance. Earlier this month, 18 opposition parties, including the JD-U, had met to pick Gopalkrishna Gandhi as their vice-presidential candidate and had discussed the alleged victimisation of political opponents by the BJP-led central government and suicides by farmers. The 18 parties, that also included the Samajwadi Party and BSP, had also agreed on greater coordination inside and outside Parliament. They had agreed to meet once a month to coordinate their strategy against the Modi government. Nitish Kumar was also seen as a possible face to take on Prime Minister Narendra Modi in the 2019 Lok Sabha polls. He had severed ties with the BJP and resigned after it announced Modi as its prime ministerial candidate for the 2014 Lok Sabha polls. Kumar had earlier also displayed his streak to take decisions independent of views of his Bihar allies. He had broken ranks with them to support the demonetisation move of the Modi government and had also supported NDA nominee Ram Nath Kovind, a former Bihar Governor, in the presidential election. Nitish Kumar’s coming out of the Grand Alliance has significant consequences for the Congress. The party suffered a string of electoral reverses after the 2014 Lok Sabha elections and being part of winning alliance in Bihar had brought it cheer. Since the Bihar outcome, Punjab is the only major state won by the Congress.